The Tudor style developed as a derivative of Medieval Revival architecture, based on Elizabethan English and Jacobean styles adapted to the Queen Ann House. As the style evolved, it began to emulate the English Renaissance styles of the 16th and 17th centuries, becoming what we know today as English Tudor. A common characteristic of the style is the use of decorative half timber, hinting at its Medieval influence. Steeply pitched roofs with crossing gables are punctuated by intricately decorated chimneys. Tall narrow windows, semi-hexagonal or boxed one and two-story bays, and oriel windows typify the style. Main roof forms are often hipped with systematic dormers or smaller gables interrupting the cornice. 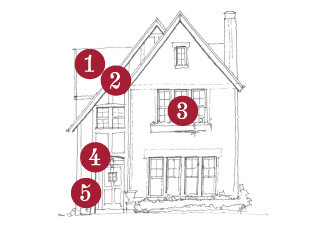 Porches are inset and centered in a gable, or off-center under a sloped roof. 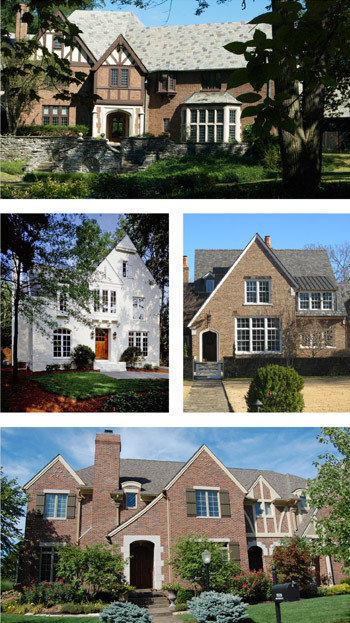 The English Tudor house is clad in brick, stone, or light colored stucco, often in a combination of these materials. Intricate patterns in the brick and stone add textural interest. Steeply pitched gabled roofs are typically finished in slate, synthetic slate, flat tile, or wood shingles. 1. Simple, well proportioned rectangular massings, ridge commonly runs parallel with street with smaller gables and dormers facing street. 3. Openings are vertically proportioned and orderly in their relationship with one another, commonly seen in sets of two to four windows, with flat trim or stone surrounds. 4. One story porch inset into a gable or long sloping roof, side porches fit within a larger roof mass. 5. Timber, stone or brick columns, piers integrated into the body form. A. Roofing – Architectural dimension shingles, slate or synthetic slate. B. Cladding – Brick; timber, limestone or cast stone, light sand finish stucco. C. Columns – Square timber. D. Shutters – Sized to close over windows; flat board, board and batten mounted with hardware to appear operable. G. Foundation – Masonry brick or stone at main body; solid masonry veneer at porch. H. Chimney – Massive masonry and/or stone chimney.